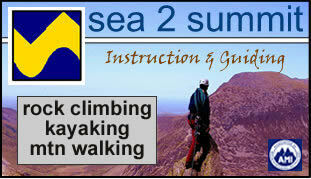 Sea 2 Summit provides personalised outdoor courses. 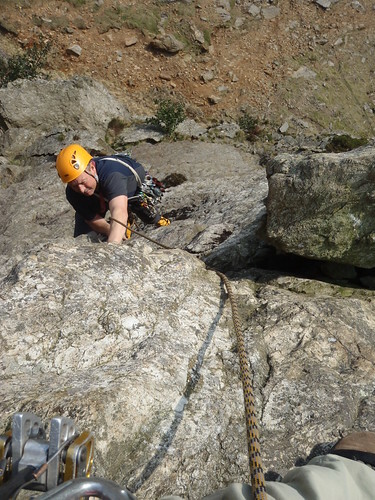 We are principally based in North Wales offering specialist rock climbing, kayaking and walking courses, for all abilities. 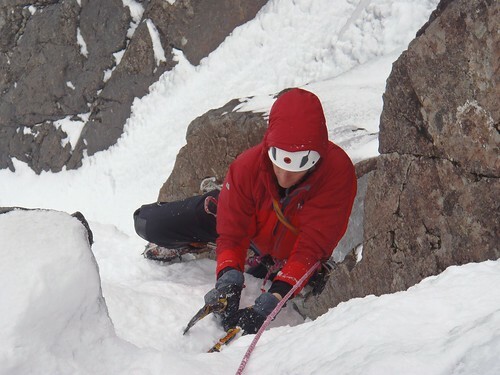 We also run winter courses in Scotland and provide multi-activity packages for groups. The main word is on everyone's lips is snow. There has been a lot of it, more than I have ever known. This is partly due to it precipitating most days but unusually there has been no big thaws. The freezing level has quite consistently been half way up the mountains. As a result of everything being buried time spent on the higher routes has been next to none. 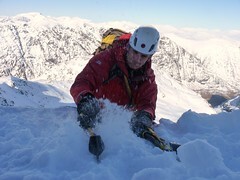 Popular venues have been Douglas Boulder on the Ben, Lochan in Glen Coe and Bauchile Etive Mor. 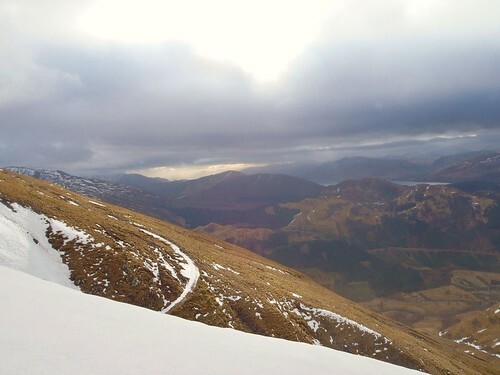 However the skiing is great, as long as the wind allows the lifts to run, with Nevis Range and Glencoe being covered to the point that you can no longer see the fences. And that's where I'm off tomorrow, to do some skiing with calm winds and bit of brightness forecast. Below are a few photos from January and early February. The start of this week it was wet and wild. Up to Force 9 on the coast (extremely strong) and lots of rain. The rivers rose and I got out on the Ogwen twice, Conwy, Nantgwryd, Dwyfor, Glaslyn. At times there was lots and lots of water. This weekend though all change. No wind, blue skies and warm. 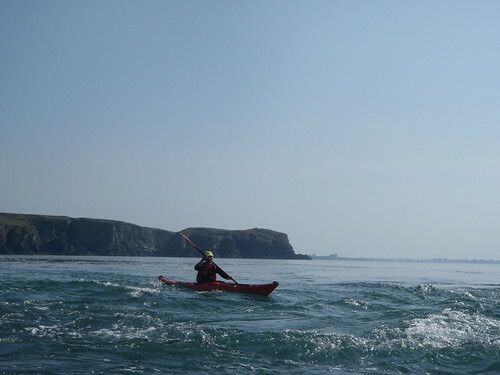 Fortunately I was working on a Sea Kayak course for PYB. The aim of the weekend was fun and ideally do a bit of wildlife spotting. Day 1 we headed to Rhoscolyn. 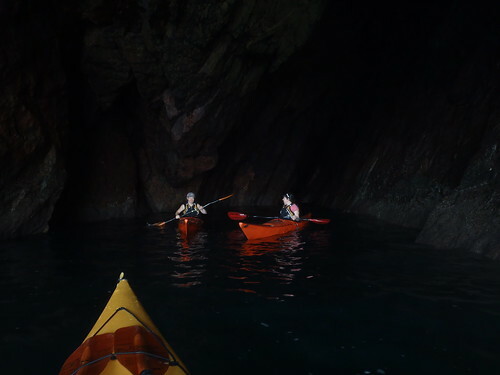 Played in the tidal flows around the beacon, through the arches, stared up at the blow hole, into the cave, saw a seal, watched a Chough (bird with red beak and legs) and a rather large jellyfish. Day 2 South Stack. Yesterday may of been very good but today was a little bit better. 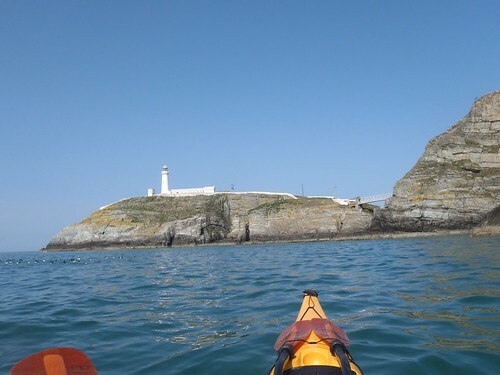 Past some cliffs, through the race at Penrhyn Mawr, past a few caves, rock hopping towards South Stack, under the bridge, felt many Razorbills and Guilemots fly past, spotted a lone Puffin then just before the relatively boring paddle across Abrahams Bosom got to follow a pod of 10 (possibly more) Dolphins. 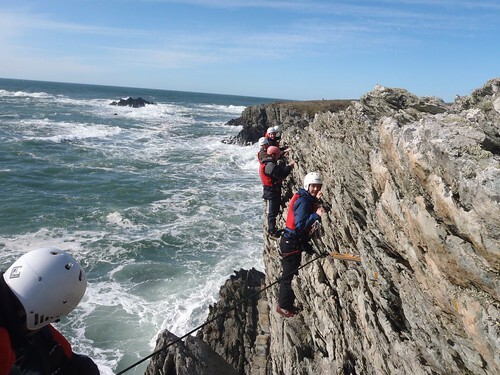 Over the weekend we had two groups in, both having fun coasteering on Anglesey and sea level traversing. These activities are excellent ways to involve a varied group in something fun and adventurous. 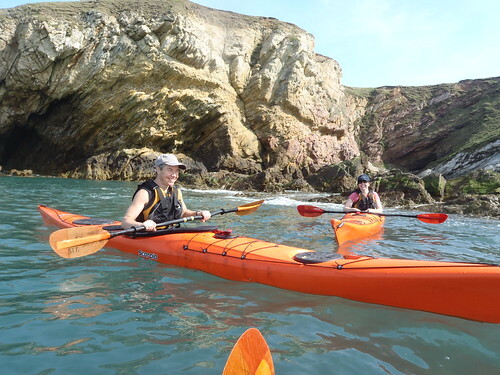 The coasteering is all about getting wet, with jumps, caves, waves and currents as you journey along the coastline. Sea level traversing uses ropes to create cliplines focusing on climbing up and down the cliffs and zip lines to take you across the zawns. 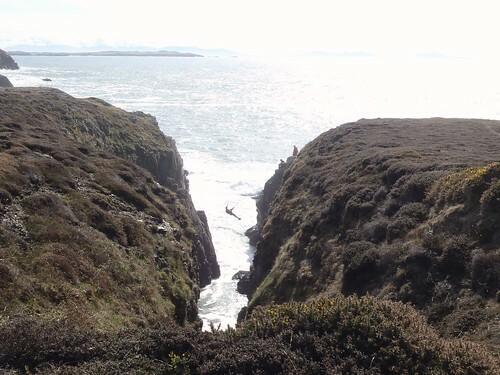 There was a fair swell over the weekend which limited the amount of coasteering that could be done. We picked sheltered zawns to play in, but even these had the odd sizeable wave coming through. The sea level traversing was extra exciting with large crashing waves beneath our feet. After all the dry and sunny weather it seemed unlikely that I would be on the rivers at the end of the week. Some localised rain brought up the Llugwy, Lledr and Conwy today, with all of them at a good medium level. We ran the lower Llugwy then the Conwy this afternoon just to stretch the arms. As the general saturation levels are currently quite low they seemed to be dropping reasonably quickly so would probably need a bit of a top-up to be paddleable tomorrow. The last couple days I have been working on an ML training for PYB, with the ovenight camp coinciding well with the onset of rain. After it had been dry for so long! 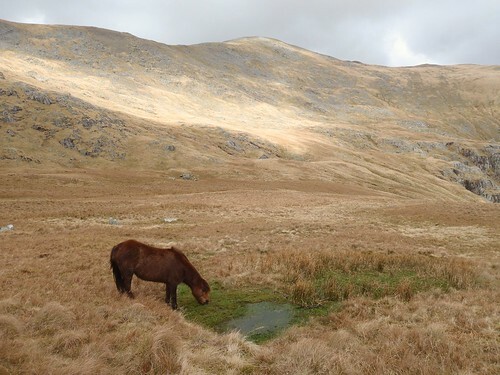 On the expedition we went up into the Carneddau camping over in Cwm Eigiau. We concentrated on the navigation and the many techniques that can be utilised to get from A to B. When darkness set in, after eating dinner, we headed out for the night nav - which the group enjoyed though challenging. Overnight the wind pushed the tents into a variety of new shapes but all survived. So back to the Brenin for the compulsory tea and cakes. 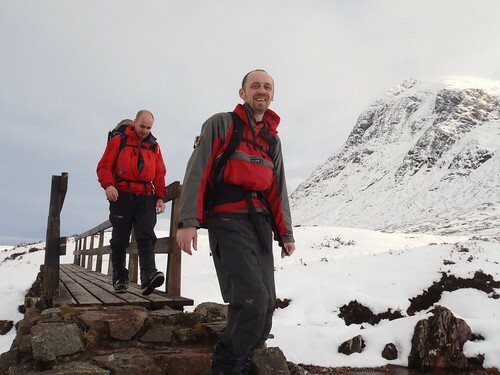 The ML qualification enables people to lead groups on walking terrain up any mountain in the uk. 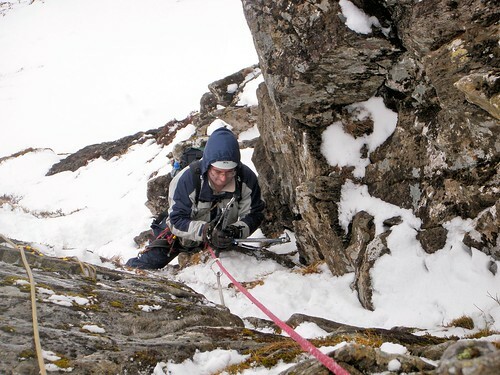 With a 6 day training course, 5 day assessment and at least 40 quality mountain days in between it takes commitment to complete the first step of the uk mountaineering qualifications. Today I was working for PYB with a school group from Surrey. 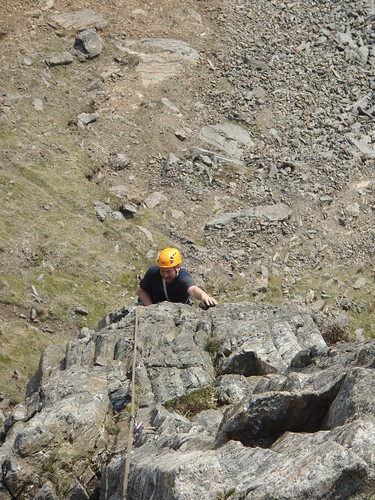 Scrambling was the chosen activity and they were all keen for the popular North Ridge. They proved to be a competent group looking after each other and easily tackling the various scrambling sections on the route. A little hazy again but no complaints were made about the blue skies and calm weather. 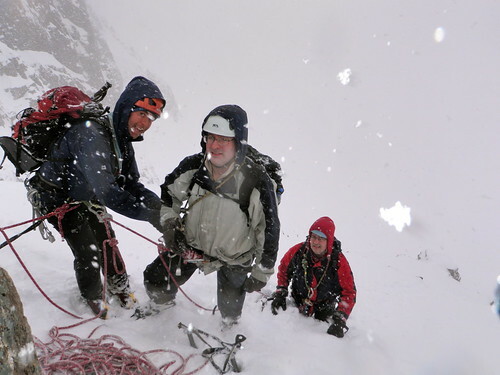 On Saturday I was out coaching Tom and Will on leadership for their upcoming 4 star assessment. We ran the river from the chipper all the way down to Bala. Each took turns to lead sections ensuring they kept line of sight and positioning themselves appropriately. Another sunny day but no good for the local rivers which are super low at the moment. 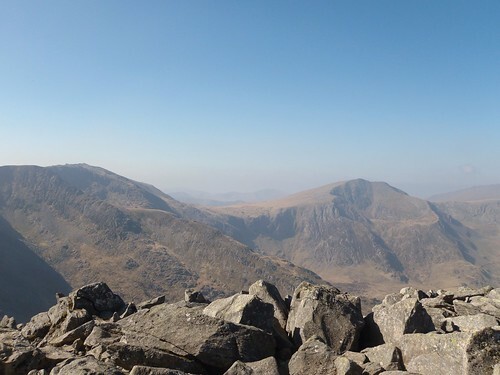 I have now returned to North Wales to be greeted by blue skies and sunny weather. Thursday, Friday I was out with Dell. He needed to do an update on his SPA for Cadets, a bit of professional development. On Thursday we went to Lion rock first and then Pont y Cromlech looking at setups and group issues at both. Handily Lou and Gareth were there with groups from Blue Peris and Kent Centre. They kindly allowed us to look at their setups and styles of group management. Later in the afternoon we walked up to Wastad and climbed the classic Crackstone Rib while discussing points on leading routes. Friday we initially went to Upper Tier at Tremadog concentrating more on rescues both for the SPA and more complicated multi-pitch scenarios. In the afternoon Dell was keen to lead a route himself so we went down to Bwlch y Moch and he led up Boo-Boo in fine style. Terry and Graham wanted to lead for real today, in particular looking at rock anchors. 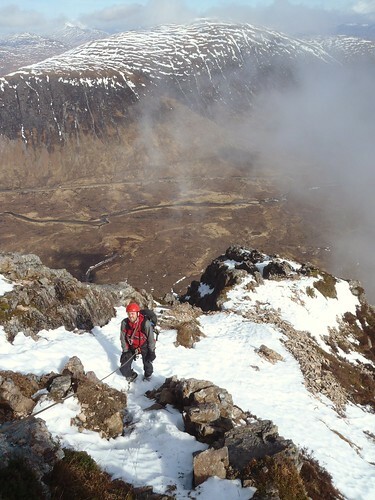 With the thaw happening all around we opted for a snow-less Curved Ridge as at least it had plenty of solid rock. As we started the drizzle disappeared and the sun shone. They both did a good job of leading all the main rock sections. I took over for the soft snow on the upper part. At least it is good for bum sliding. No. 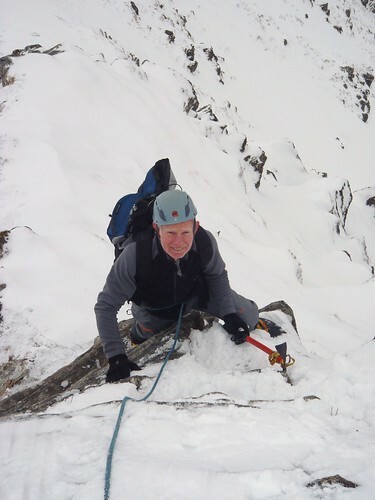 3 Gully Buttress , Ben Nevis. Nice and warm today, I didn't have to wear to many layers. However the ice was a bit soggy and snow certainly damp. I was working for Abacus today with Terry and Graham again. 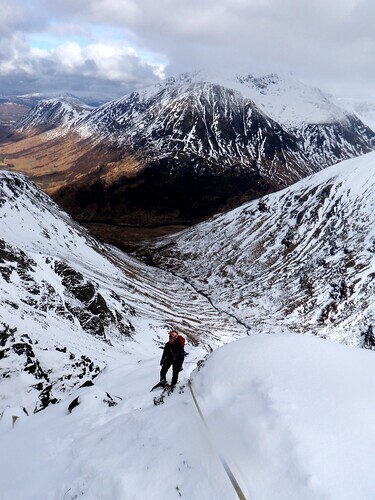 We headed up the Ben in search of ice and a safe route to climb. The snow in the Ciste is certainly wet but generally stable, now in one homogeneous layer. There was however a fair bit of debris that had fallen down from above, presumably cornice collapse. We went for the Quickstep start then across on No. 3 Buttress. 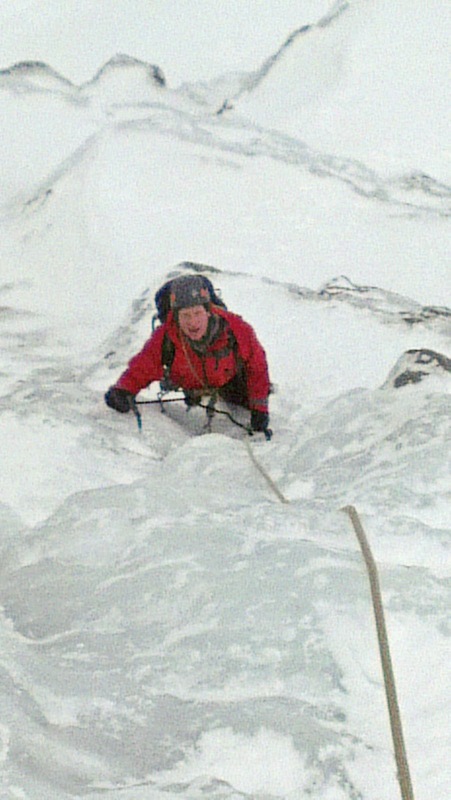 Climbable ice, even took ok screws, keeping away from anything that may want to detach itself from above. Things were certainly disappearing quickly. Vanishing and Waterfall gully were living up to there name. It was very claggy today so impossible to see other routes. As long as things hold in tomorrow looks like it is getting colder from Wednesday and the snow will readily turn to neve. 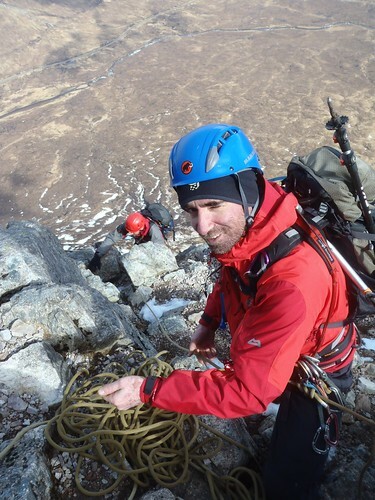 Team Ireland were on Stob Ban. 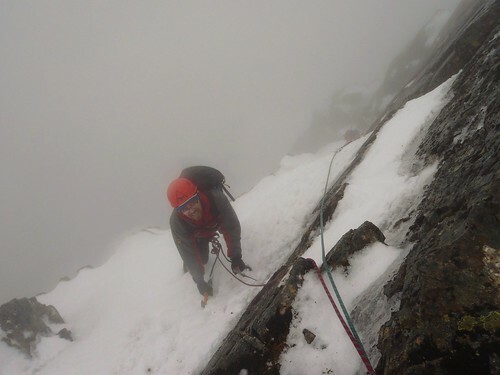 The climbers, with Kath and Paul, ascended the East Ridge which gives great climbing at the grade. I took the others up the North ridge and over the top. A nice day with cloud free peaks. A fair bit of snow has now disappeared from the lower slopes. Higher up there was some firm slabby snow, though the freezing level felt to be near the top of the peak. First outing of the season for the walking axe today. I was out with members of the Irish Christian Walking Club taking Peter, Ronin and Lorraine through there paces. 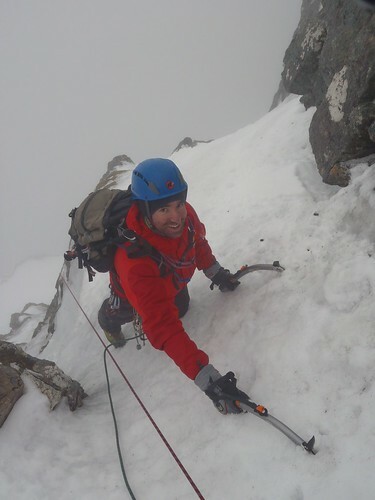 Kath and fresh from assessment Paul were also with 3 fellow members Donncha, Conall and Martin on Dorsal Arete. It all started out nice and sunny but by midday the snow and wind came in. 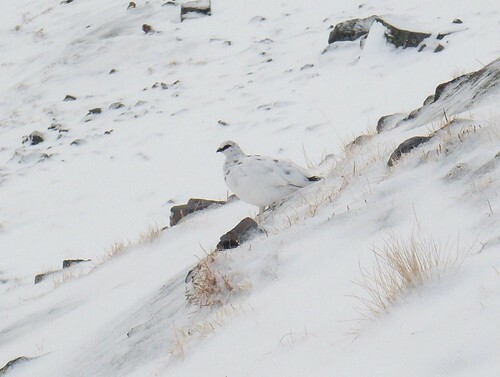 We wandered around the corrie looking at snow and doing a bit of sliding. 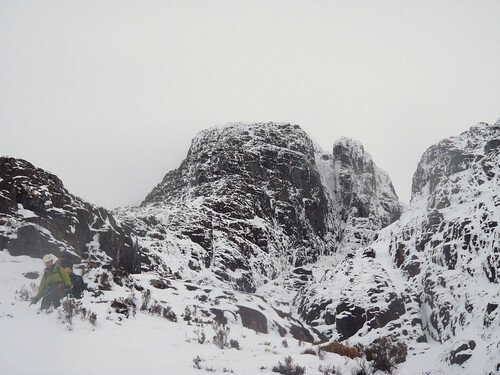 There was a new wind slab building with fresh cornices building around the corrie rim. Snow level is still low but it felt like the freezing level was around 900 to 1000m today. Second day with my Dad and friends Tom and Will. 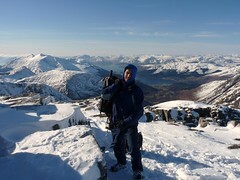 Although the track is a no-go, with snow and stuck mini buses, it seemed rude not to head up to the Ben. There is a track that leads all the way to the CIC hut. From here we headed over to Waterfall Gully, climbing the first 50m in two pitches. This provided fun grade IV ice. 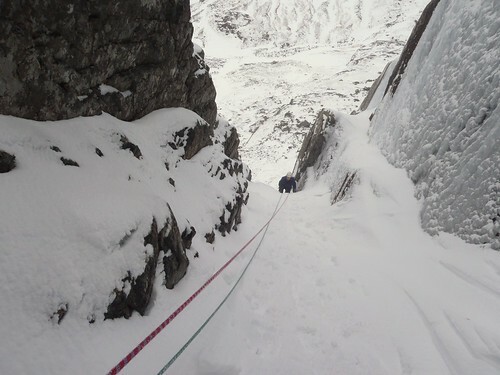 While up there we also played on some steeper ice on the left. Gemini was certainly forming but not there yet. After this we wandered over to some ice to the left of the gulches. There was some significant amounts of poorly bonded slab below No. 5 - easily sliding on an icy crust. Sunny, sunny. Blue bird day today. 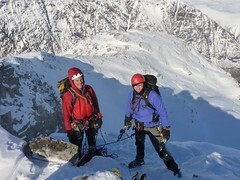 My dad has come up for two days for his Scottish winter hit along with two friends from the Wirral. 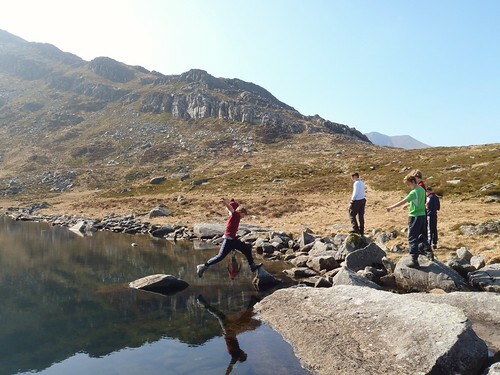 We stomped into the Lochan to find our place on a route. The track in is good, but the snow is deep elsewhere. A fair few teams about today. 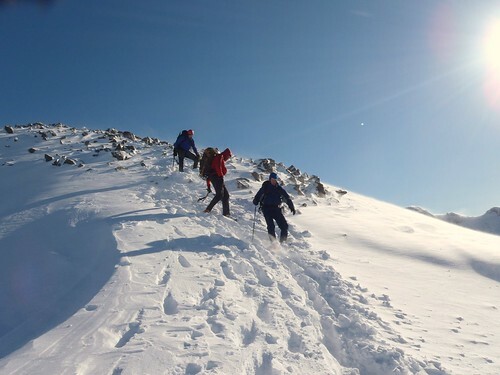 Wanting to avoid anything with quantities of snow I initially headed over to the Pinnacle area - bit busy. 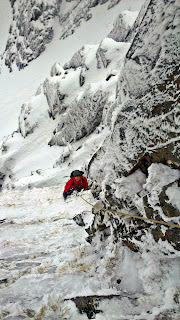 We slotted into Raeburn's in the end - that certainly on the upper pitches had a good quantities of useful soft snow. Other parts of the crag that have been in the sun are now stripped back and look quite dry. This includes a lot of the main mixed routes. It did the job. 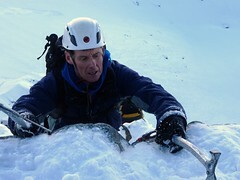 A track was in place, gave the required grade of climbing and an opportunity to look at rock anchors - plus being safe. 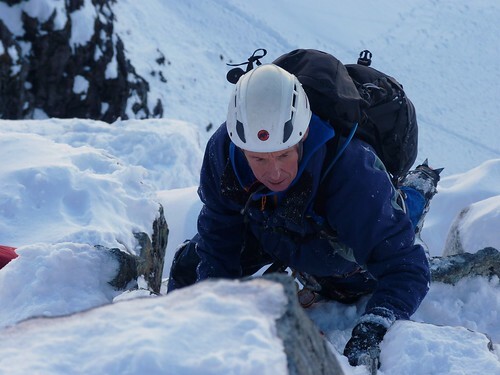 We were joined by Tim and his assessment team that included Si Lake, James Thacker and Chris plus another 3. Sociable start but everyone managed to find their place and climbed quickly. 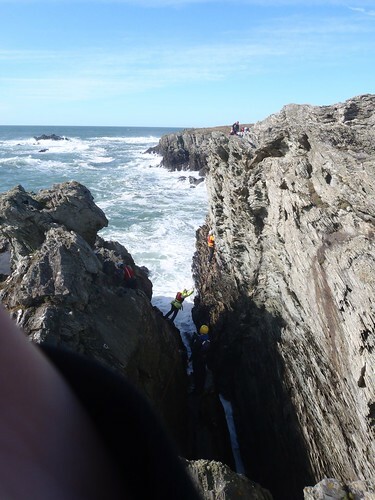 The assessment team went up and over the others abseiled back to the start. There was a fair bit more snow than last Thursday, allowing for a few more footholds and bit more to swing at. In the morning there was a bit of mini snow storm but this cleared later to give beautiful views across the moor. I was working for Abacus today with Graham and Terry. 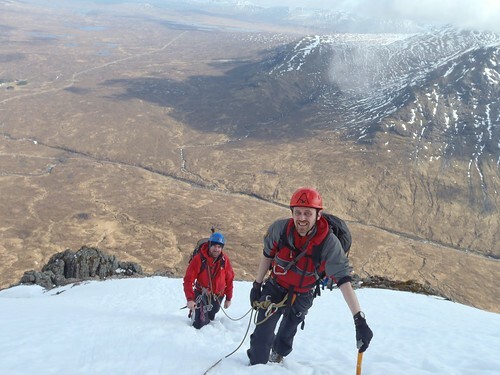 They are back next Monday for another two days of climbing fun.